Equipped with powerful features, the Field Staff Tracking tool from ConnectMyWorld makes remote team management easier, quicker and more efficient. It is designed to offer unmatched speed, live tracking, task management, and robust reporting at your fingertips. The immense versatility and real-time performance of our app makes it the perfect growth partner for your business. Managing remote staff can be challenging if you do not have the right tools. Allocating tasks to employees, tracking task status, and reviewing performance becomes difficult in case of a field team. To help you ensure maximum performance and productivity from your remote team, ConnectMyWorld brings to you Field Staff Tracking app. This staff tracking and management system is designed to manage hundreds of employees in a single account. With over 8000 devices already using the platform to redefine field performance, this is one of the best remote team management tool in the market. It is lightweight, battery and data optimized, and delivers stunning features to give you complete control and comfort. The field service management software also helps create a transparent system allowing both the manager and the field agent to effectively communicate. Reliable field staff tracking and management solution with a wide range of features to help you increase the productivity of your team. Assign and schedule tasks for your team, and view when they are completed. You can add, edit, and cancel tasks in real time, with the feature of linking a location to a task. Get live tracking and past history of employee movement, including total distance travelled in working hours. You also get details like route taken, device battery status, and more. The Field Staff Tracking app is much more than just a tracking tool. You can go through task reports, review employee performance and stay productive without the internet. The software allows your team to get survey forms filled out on the go. No matter how complex your data collection form is, you can easily build it on the app and speed up the responses. Get detailed insights on employee task status, time on field, time taken for a task etc. right on your smartphone. Regular alerts and downloadable reports make evaluation easier. An Android device with GPS, and an internet connection is all you need to get started with ConnectMyWorld. Simply download the app on your smartphone, and you are good to go! Fully loaded with features such as highly sophisticated, unmatchable, reliable Field Staff Tracking, Staff Attendance, Field Service Management to efficiently assign and manage work. ConnectMyWorld’s Field Staff Tracking app is your ideal choice irrespective of the nature of your business and the size of your field staff. It’s highly customisable and immensely versatile. After going through free trial step and to use the application, For App user guide Click Here and for Admin/Supervisor guide Click Here. 1. Highly Sophisticated, Unmatchable, Reliable Field Staff Tracking App, Works Without Internet Also. write to us(support@connectmyworld.in) or call us (+918105815801) for more detail. A comprehensive lightweight solution specially designed for employees working in the field. Live tracking and past history of employee movement, including total distance travelled in working hours. View the route taken by the employee on map with speed and device battery condition. Configure Geo Fence for arrival and departure report for locations of interest. Centrally managed attendance system with all visited places as checkpoints. Get a report on stop time summary to estimate the performance of the employee. Get alert and view report for any deviation in the rule of engagement with the employee with time and location. Our Field Service Management solution allows you to allocate and manage the work of field staff in a transparent manner. Perform surveys, audit and other field data collection with our fully customizable data collection forms. Works with most Android devices with GPS. Live tracking with very good(5 to 10 meters) accuracy. Respects individuals privacy so no legal complications. Very easy and quick implementation. Highly optimized for battery and data usage(approx. 50 MB per month). Supports hundreds of employees in a single account. Controlled access to various application users and supervisors. Can Integrate with existing ERP/CRM systems. Guranteed lowest Subscription rates in the market. Only approx. 50 MB data per/month required. It is definitely huge return of investment, as what you invest and what you get is unmatchable. Android devices get cheaper day by day and now it is available for less than Rs. 3000 also. If employees in the organization already having the android device means almost no or very less investment on hardware. Construction companies, oil rigs, sales & marketing agencies, pharma companies, technical service providers, NGOs and many other enterprises work with field employees. It becomes very difficult for the manager or the administrator to allot work to the subordinates and keep track of the work done. This challenge is solved by the use of field staff task management software from ConnectMyWorld. An easy-to-download and use field service management software application, it allows managers and teams to seamlessly connect and communicate. This Android-based application is simple and easy to use. Plus, you don’t need high-end technology or in-depth computing knowledge to use this field staff tracking software application. Designed to work based on GPS technology, this field staff task management and employee location tracking software offers a convenient and efficient way for managers to track the productivity and performance of the employees working out of office. The field service management software can be customized according to the needs and preferences of your workforce. The manager can easily monitor the work of the entire team using this mobile application. Schedule the tasks for each day so that even if the employee is not in the office, he is aware of the priority tasks that need to be completed first. Once the field agent completes the task, he can update the information on the app, so that the manager will immediately get an alert that the priority task is completed. This way, there will be no confusion or delay in completing the work. The field service management software also helps create a transparent system allowing both the manager and the field agent to effectively communicate. 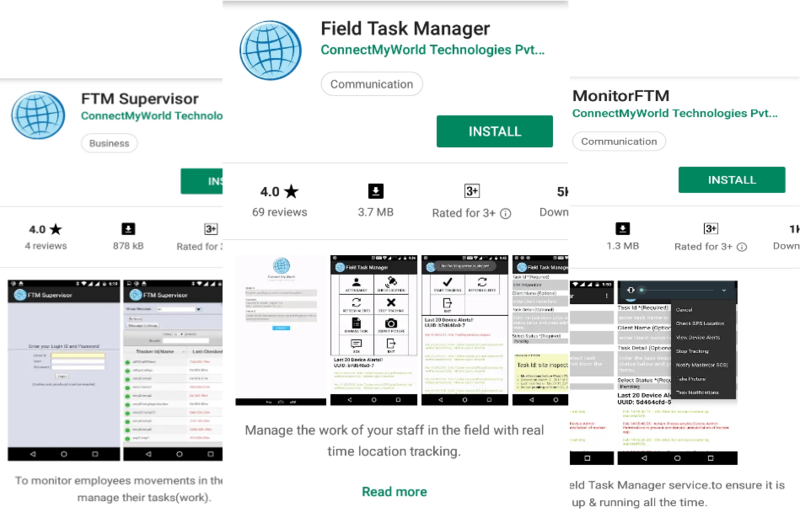 This field service app offered by ConnectMyWorld to create a better and efficient work process in your business enterprise. Our solution is also capable to provide customized data collection forms for any type of simple and complex field data collection. All the data collected will be Geotagged and data can be collected when there is no internet or network. This feature is very useful for doing surveys, performing checklist, proof of delivery, taking customer orders, submitting daily activity report etc. What you are currently capturing through spreadsheet or word document template we can easily convert this into Android Data Collection Form. Already more than 8000 devices are connected to platform. For free trial, Click Here to follow the steps: Only hardware requirement is to have Android devices with GPS. Also Click Here to watch the videos as to how to use some of the basic features of the platform. The field staff tracking and task management system is designed to manage hundreds of employees/staff in a single account very easily. Any kind of corporate assistance to bring you to speed from us is complimentary. 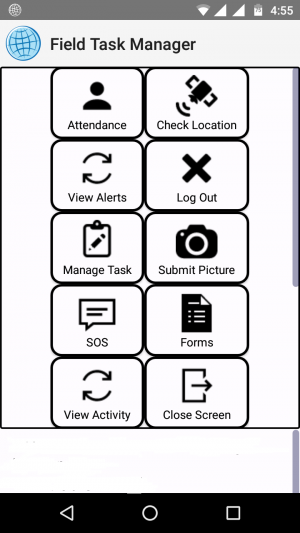 very fine app for attendance monitoring and tracking. Wonderful app for field employee tracking. My Sales and Marketing staff is spread all across India and without this app, it was really a nightmare for me to have proper visibility on my field staff. 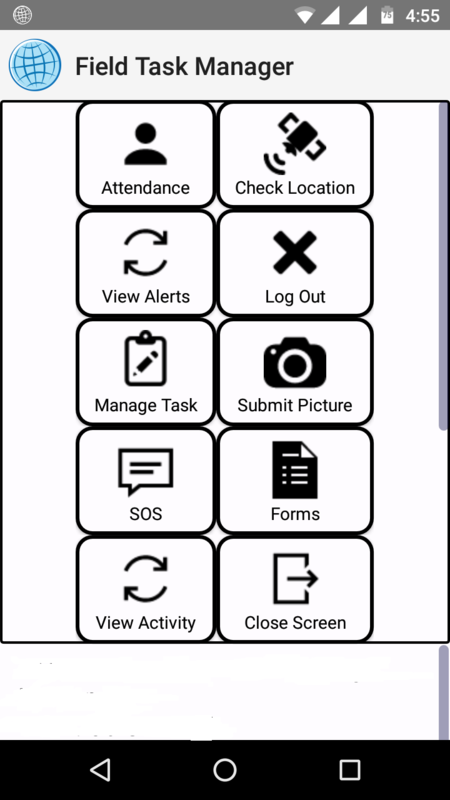 Field Task Manager has helped us to implement Staff Attendance system with all the details which are required to run the show smoothly and efficiently. 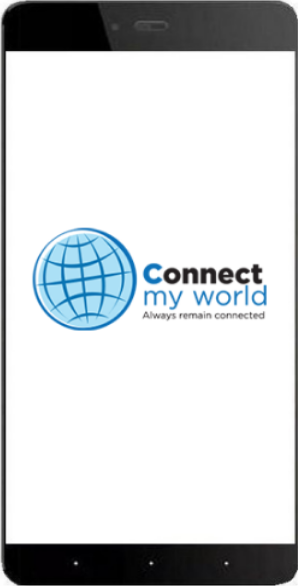 Thank you ConnectMyWorld for providing such a wonderful solution for us. This app is very useful for doing field survey and audit.This app also works very well in remote places where internet is not available. Yes ! I do Recommend this “Field Staff tracking App” wonderful app to track yet simple interface. I was thrilled to know about the smartphone GPS tracker. Just recently I bought a brand new smartphone and was always frantic about it being stolen. Thanks to the GPS tracking I can now trace down my smartphone in the event of any loss or theft. The GPS device is a package deal with an amazing price and long battery life! I strongly recommend it. A very impressive device – smartphone GPS tracker! Since am a logistic company employee and I take care of delivery and schedules, the tracker has helped me a great deal in keeping touch with my fellow delivery men and guiding them accordingly. This way we manage to clear off maximum deliveries there by meeting the targets set daily. Thanks to science and technology, things have become so convenient! When I decided to get a GPS tracker for all my field agents, they were totally against the idea. However, I explained that the employee tracking app from Connect My World has a switch off option. Moreover, they were able to understand how it will help track their productivity. So, now all of them are using it. I have 5 technicians working in my service center. One big problem I had was sending the technicians to the client’s place on time. I got the employee tracking application and installed it in all my technician’s smartphones. Now, I can easily track their location and send the closest person to the client’s place. When I read that using a GPS tracker can improve team’s productivity by 20%, I didn’t believe it. Anyway I decided to get the tracker from Connect My World and give it a try. I got a smartphone tracker for all the on-site employees in my office. Now, I can surely tell that their productivity has greatly increased. I have 5 technicians working in my service center. When a customer calls for a repair, I used to find it very difficult to locate the technicians and send them over. That problem is solve with this smartphone GPS tracker. Thanks to Connect My World! Using the employee tracking software application from Connect My World has improved my field agent’s performance. They can fill the task status form as and when they complete the job. So, less travel for them and less hassle for me. I had lots of problems with my field agents. They would say that they are near the client’s place, but will take hours to get there. I used to get lots of complaints about my agents being very un-punctual. That’s why I got the employee location tracking app. Now, they don’t waste time and reach the client’s place on time. I started using the smartphone GPS tracking software to monitor the work of the field agents in my company. Now, I don’t have problem checking attendance, time at work, and other details. Plus, this app is so easy to use that even my non-technical staff members effortlessly operate it. I am a medical rep and travel a lot on work. Though I work very hard, I would find it difficult to prove my work when I attend the review sessions. They will not accept my remarks and reports on the work done. The company then came up with the concept of using a smartphone GPS tracking application. Now, the app generates all the reports, and I am able to prove my work to them. Running a business enterprise that involves many field agents is a huge risk, especially when you can’t check your employee’s productivity. This was the problem I was facing in my company in the start. However, after my friend suggested using a GPS tracking device, I am now able to monitor all my employees from my office itself. Recently I got a smartphone GPS tracker for my personal use. It is easy to download the application and use it. I have given a tracker each to my grandparents. They are living alone in the village. With the tracker, I can keep a constant check on their movements and ensure they are fine. I run a pharma research center and employ many field agents for market research. It used to be very difficult for me to check if they’re working until I got the smartphone GPS tracker. Now I have given a tracker to each of my employees working out of office. It is easy for me to track their work. When I first thought of getting a GPS tracking device for my family, I was wondering if it will be very large and difficult to carry. Then I found out that it is a software application that can be downloaded to a Smartphone! So easy and convenient to use. I am working in the HR department in a large corporate, and one of my primary responsibilities is tracking employee attendance. It used to be very difficult as most of the employees work in the field, out of office. After the management got the employees to use the GPS tracking software, my job has become relatively easy. As the head of the marketing division of a manufacturing company, I was constantly looking for ways to improve my team’s results. I signed up with Connect My World employee tracking software program. This online platform allows me to check all the sales person’s locations in one view. I am the head of a sales team in a marketing company, and it’s my job to ensure optimum performance of my sales team. After I started using the employee tracking software, the performance and productivity of my team has improved by nearly 30%. Thanks to the smartphone GPS tracker, I am now able to efficiently track the movements of all my field staff. I don’t have to worry about the work done and also of their safety. The Smartphone GPS tracker is so very easy to use that even employees who don’t have technical expertise are able to use it. It is very convenient for me and my field agents as well! I used to find it difficult to communicate with my field staff and was looking for an efficient solution. I found it with the Connect My World smartphone GPS tracker. Now, I can easily communicate with all my staff on the field. I wanted to get a Smartphone GPS tracker for all my field employees. The problem was that they would use the phone for their personal purposes. When I spoke to Connect My World about it, the staff adjusted the settings to give restricted access to the different features in the phone. I got the Smartphone GPS tracker from Connect My World for all of my field employees. Now, I can find out the location of all the staff even when they are on calls during office hours. I got the employee GPS tracker from Connect My World. With this tracking application, I can see the location and movement of all the field staff in one view. It was so difficult for me to get conveyance details from my field agents. After I got the employee tracking software, I don’t worry about it. The software automatically calculates the distance traveled each day and maintains a log. I run a home service business. After I got employee tracking software for all my field workers, the productivity and profit has increased. Also, my employees are happier because they can record the work that they’ve done. The employee location software from Connect My World has been very useful for my company. My field agents can now easily contact the office and also submit reports from anywhere. The field tracking service software can be downloaded to a Smartphone and used. I got it for all the field agents in my company. This field tracking software allows me to coordinate with all my employees without any problem. It also lets me check their work status even if they are not in office. I thought that this field tracking software will be very difficult to use, and was hesitant to get. Now, I am happy that I got this tracking device. It is so easy to use. This field service tracking software gives me real-time updates about my employee’s movements. I am very happy with my purchase. Most of the employees in my company work out of office. During appraisal times, they would come and tell me how much work they did. But there would be no proof of their work. I now use the reports generated by this field tracking software to track their performance. I own a sales-based company. Earlier my field agents would tell me that they travelled so far or spent so much time with the client, I had no way of cross checking the details. Now I use the field service tracking software to cross check all the information. I have a medical store and offer free delivery to all my customers. As we are open 24/7, we get emergency calls at all hours. I use the field service tracking software to find out where my delivery boys are, and make sure the medicines reach the customer’s home at the earliest. I run a small company where most of my staff work out of office, in the field. Come appraisal time, everyone asks for increments, but no one is able to provide solid proof of their work. So, I gave everyone a mobile phone with field tracking software. Now everything is recorded and reported. Makes my job easy! With this field service tracking software, now I am easily able to coordinate will all my sales people. I run a wholesale candy business, and cater to lots of super markets and small stores in my city. Now, if there is a demand somewhere, I can easily find out the nearest field agent using the field tracking software and send them to the spot immediately. For business people like us, this amazing field service tracking software has done wonders by bridging the gap between the employers and field staff members. The field tracking software has enabled me to have a continuous tab on the location of my employees and reinforced my trust in them, and that they are at the right place and at the right time. Field service tracking software is something regarded as a solution to growing your business. The field tracking software helps monitor the behavior of the large number of employees of whom otherwise keeping a track would have been quite impossible. The employees also become more or less efficient as they know they are being watched, hence an effective solution for business growth! I have a huge army of workers employed. It becomes very difficult for me to trace down any one of them as and when the need required. The Field service tracking software has helped me a lot. Now with the help of the field tracking software I have just located the particular employee and get in touch with him. I was personally not satisfied with my on the field staff. But there was no way to keep a check on them. Then I read about the field service tracking software. With the help of the field tracking software I am more relaxed. I can keep in touch with my team and also get location updates and now I can keep a check on as to what are they up to and where there is a time lag, if any. I have increased the mobility of my sales team with the field service tracking software. The field tracking software has helped me stay in touch with my boys so as to enable me to redirect them according to the delivery schedules. This avoids the time-gaps that could be created otherwise. Today I know why people are talking so much about the benefits of the field service tracking software. Now I am also among the few who have caught hold of the field tracking software. It has helped me tremendously by staying in touch with my sales staff, thereby avoiding time gaps or delays of any sort. The one way that struck me to optimize my team’s productivity was the field service tracking software. It maintains connectivity between me and my team, and I can ensure my staff is doing their work right. The field tracking software is just too good. In my kind of sales business, I am more than dependent on the performance of the sales team for the profit margins to move higher. In such a scenario, I needed something like the field service tracking software that would enable me to keep track of my staff. The Field tracking software helps me manage calls, interact with my team, redirect them, help them with location access etc. What happens when one is stationed at the office and the staff is scattered on the site. No worries! The field service tracking software enables to keep track of the entire staff location in a single view. It gives a boost to the business as it’s the fastest way to track your staff and get in touch with them via the Field tracking software. The field service tracking software helps me track the movement of my staff. With this wonderful Field tracking software I can view all my staffs location in a single view. Further, it gives me the total distance covered by the staff. It has an immensely wonderful battery life of 20 hrs, hence it can be used for the whole day hassle free. I have become more than relaxed with respect to the movement of my staff. The field service tracking software gives me location updates about my salesman when they are out on the field. Field tracking software, can be easily installed on any Android based smartphone. It sends alerts via SMS when the phone enters a prohibited zone. I can now come in touch with my men and guide them otherwise. All this and more at an affordable price. Today when innumerable thefts are on the rise, safety of mobile phones has become mandatory. Thanks to the field service tracking software, I can now track down my mobile phone when its lost or stolen. I can also get an alert via the Field tracking software if and when my phone enters a prohibited zone. As soon as I heard of the Field service tracking software, I immediately sprung with joy. Straight off the concerns of maintaining track of salesman out on the fields would all be resolved. With the Field tracking software, I can immediately see all my teams’ location, also if any of the salesman is lost or is at an unidentified location, SMS alarms are charged to my phone. This is truly amazing for my kind of business. I am at utmost ease whilst my on-field salesmen are at their job, thanks to the Field service tracking software. It helps me track down the locations of my men, also Field tracking software, gives me the current location of my whole team in a single view. That’s truly amazing. This way it gives me the liberty to make necessary changes with respect to schedules. The field service tracking software has proved to be an excellent investment for me as I can get live movement of my on-field staff. After having installed the Field tracking software, I can easily monitor the movement of my team, as regards to any cancellations of amendments in the day’s chart. It has helped a lot in boosting my business. The field service tracking software is a one time investment that guarantees hassle free life for me. Field tracking software, gives me live field monitoring of my team. Not only this much, it also comes of use in case the phone is lost or stolen! Now I need not call individually my sales team to find out the location and the updates. All this is possible absolutely live with the help of field service tracking software, wherein live updates can not only be tracked but also be viewed. Now, I can view the live location of my men. The Field tracking software also gives me alerts as to when my men enter a specific area as specified by me. All this and a lot more at an unbelievable price! After getting the field service tracking software, my business has suddenly got a boost. With the field tracking software, I can now track down my sales staff, and ensure that in case they are stuck or cannot locate an address, I am able to guide them accordingly, and help them reach the location on time. So also in case of any cancellations, am able to redirect them, hence they do not waste time. Field service tracking software helps me track the live status of my team of salesmen. I can get the location of my entire team in a single view. It has given a boost to the teamwork level between me and my team. I have installed field tracking software in the individual phones. It helps me trace down my team and redirect them with the necessary changes. It has made us work more together in an efficient manner. Field service tracking software as the name suggests is an excellent means of connection for me with my field staff. The field tracking software keeps me up to date with my delivery team and I also guide them accordingly with changes in client addresses, appointments & cancellation schedules too. An amazing stand up battery life makes it a must buy! Just when we were flooded with Smartphone android software, field service tracking software is just what we needed. By installing this field tracking software I can even trace the whereabouts of my mobile phone, if stolen. It alerts as soon the phone enters new unprescribed zone. A must buy! Many many thanks to the field service tracking software. It has increased my mobility whilst sitting in office with the help of the field tracking software. It has given a tremendously wonderful boost to our mutual work relationship. We now perform better as a team. It has a long battery life to boost up its performance. A strong recommend to buy. Field service tracking software has boosted up the teamwork level between me and my sales team. With field tracking software installed in the individual phones, tracking down my team and redirecting them with the necessary changes has become very convenient. Makes us more time efficient. As a field salesman, field service tracking software is an excellent means of communication for me with my office. With the field tracking software my office keeps me up to date with client addresses, appointments & cancellation schedules too. It also has an amazing stand up battery life. Thank you so much for the amazing field service tracking software. It has completely changed the rapport with my employees. I am now able to track the location of all my staff that is on field work in one single view with the help of this field tracking software and it has done wonders to our mutual trust. I am a wholesaler and this field tracking software has helped me a great deal in keeping a check on my employees and improving business. Earlier my delivery people used to take hours for a single delivery and so business was not so good but thanks to field service tracking software, I can now get more out of them. the features seems to be impressive.